Traveling in Morocco is a journey into a mosaic past where spices are numerous and pungent, the streets are filled with a million different sensory distractions, the culture is palpable and exotic, and the colors are as intense as the heat. A holiday here is the trip of a lifetime, and although the entire country is worth seeing, here are a few can’t-miss spots for urban exploration (as well as some off-the-beaten-path adventures and a few tips on how to be a savvy traveler in this energetic country of contrasts). Marrakesh is an ancient, sleepless city and the perfect place to set the tempo for the start of your African adventure. In all likelihood, Marrakesh is the city you will fly in and out of, and for this reason there are plenty of tourists here. If you explore the city on your own, sans guide, these tourists will not detract in the slightest from your experience because of the sheer size of the place. The city is divided into two sections (as many of the larger Moroccan cities are), the "new" city and the old medina. Many of Morocco's medinas are still surrounded by an ancient fortified wall, and Marrakesh is no different. Inside this wall, in the medina, is where you should focus most of your time (unless you are looking for upscale shopping or a Starbucks). The twisted, bustling streets in the old city are filled with hundreds and hundreds of tiny shops, beautiful palaces, museums, a main square (complete with snake charmers and just about everything else), and maybe the most extensive labyrinth of souks (massive collection of handicraft shops) of any city you might visit. Like Marrakesh, Fes has an old, walled medina and a new town. It’s also quite large and is a must-see city on most people's trip itineraries. The medina in Fes is famous for the 1,000+ year old tanneries that are still in operation throughout the city as well as the thousands of winding, narrow streets that make walking the city so enjoyably difficult to navigate. There are several museums in the city, but most people spend their time continually wandering through the souks and browsing the endless Fes pottery and leather shops. 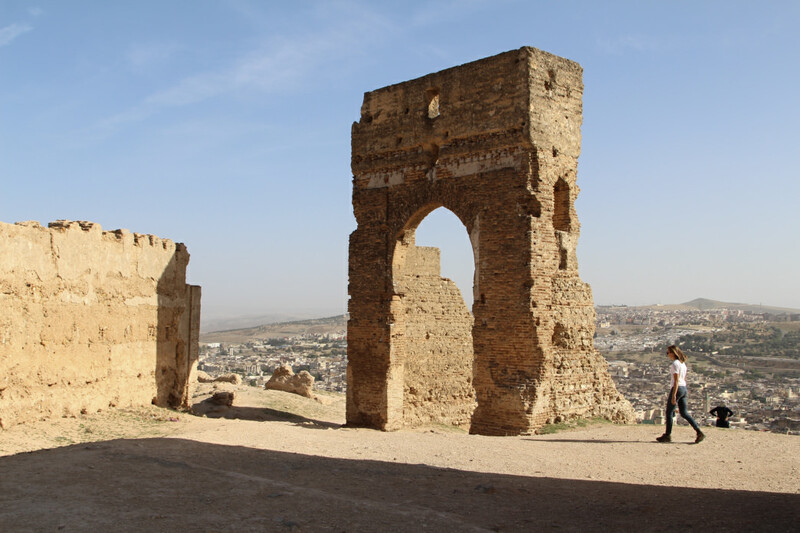 Meknes is very close to Fes, but less frequently visited by tourists. The main attractions here are the impressive walls of the old Imperial City and the famous Roman ruins from the 3rd century BC, Volubilis, about 20 miles away. If you talk to anyone who has ever made the journey to Morocco's "City of Blues" they will most likely tell you that it was their favorite city they visited. 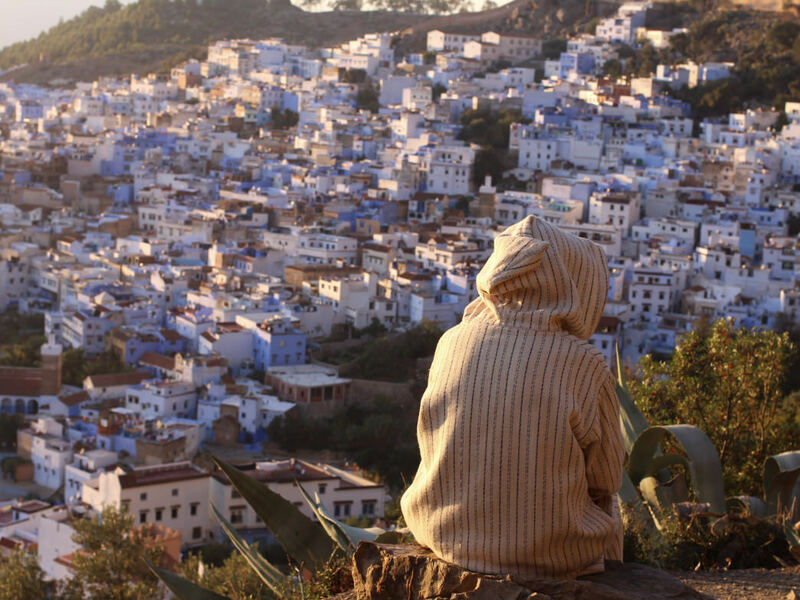 Chefchaouen is significantly smaller and much more relaxed than other popular cities, and is the perfect place to get away from the craziness of some of Morocco's urban hustle and bustle. The entire city is painted in shades of cool blue that give the place an ethereal quality that feels more dreamlike in nature than grounded in reality. Needless to say: walking aimlessly through this labrynth of blue is an experience for the life-list. While the city's brilliant coloring and the many streets of the medina are the top attraction here, the scenery around the town is just as fantastic. 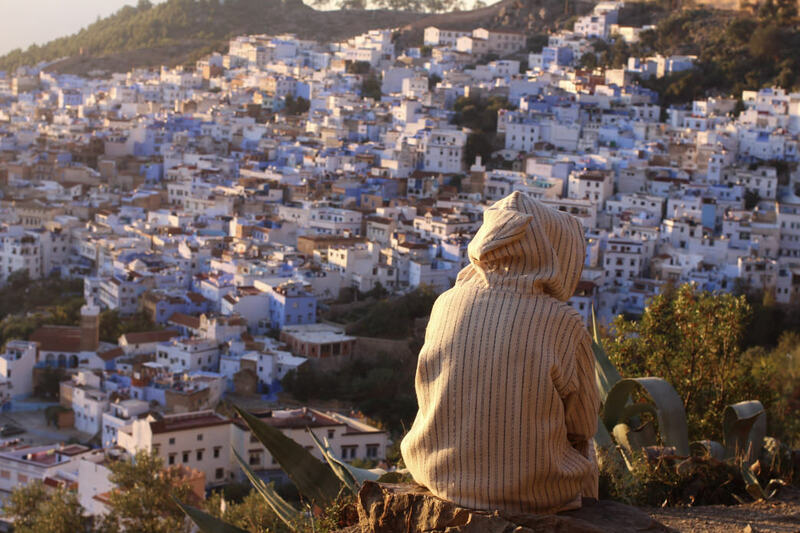 Chefchaouen is tucked against the Rif Mountains, one of the country's lesser-known and far less-visited ranges (although no less-scenic than the better-known High Atlas). This proximity to the mountains provides some grand adventure opportunities, which will be explored below. For those with a longer stay planned, Merzouga is well-worth the trip. The Sahara Desert is one of the great natural wonders of the world and this small desert village is one of the best places to feel surrounded by the largest sandbox on Earth. Getting here is a bit of a pain, but if you have the time it will be a highlight of your travels. Many excursions with local tour companies into the high dunes are based out of the village, and prices are surprisingly very reasonable. Any quick Google search can show the masses of guided excursions and multi-day adventures available to the tourist in Morocco. Finding DIY outdoor information online on the other hand? Not so much! But while the resources may be slim, the potential adventures to be had are endless. Imlil is the perfect jumping-off point for backpacking adventures into the High Atlas mountains, and it’s a fantastic little village on its own. Settled beneath towering peaks that would make you think of the Alps, Imlil is quaint and unapologetically focused on the trekking visitor. The highest mountain in Northern Africa, Jebel Toubkal (4,167 meters), is only a 5-6 hour hike from town, and the easy climb (compared to other high peaks) draws hundreds of adventure seekers a year to the summit. For travelers with more time on their hands, there are also several 3-7 day backpacking routes that follow ancient footpaths between Berber villages leading up to Toubkal and back to Imlil. You can find maps in Marrakech or Imlil. Getting to Imlil could be one of the greatest adventures of your entire time in Morocco. Starting from one of Marrakech's Grand Taxi banks, you will quickly be identified as a backpacker trying to get to Toubkal, and your bags will be tied to the roof of a van of questionable mechanical soundness. 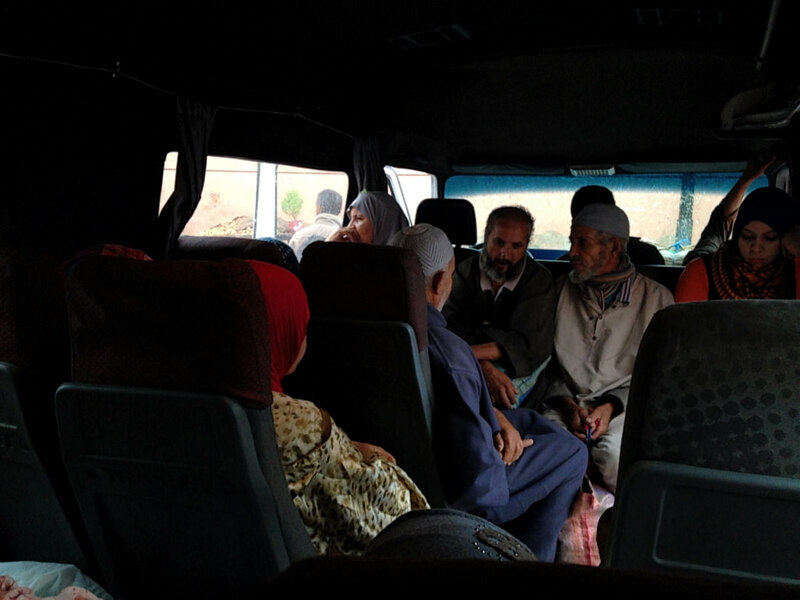 You can get a seat in a 12-passenger van for 50-60 Dirham a person (about $5), though there will likely be upwards of 30 people crammed inside for the 2 hour ride. Make sure to watch your bags at every stop in case you need to change vans—if your bags are unloaded you probably should get off, too. 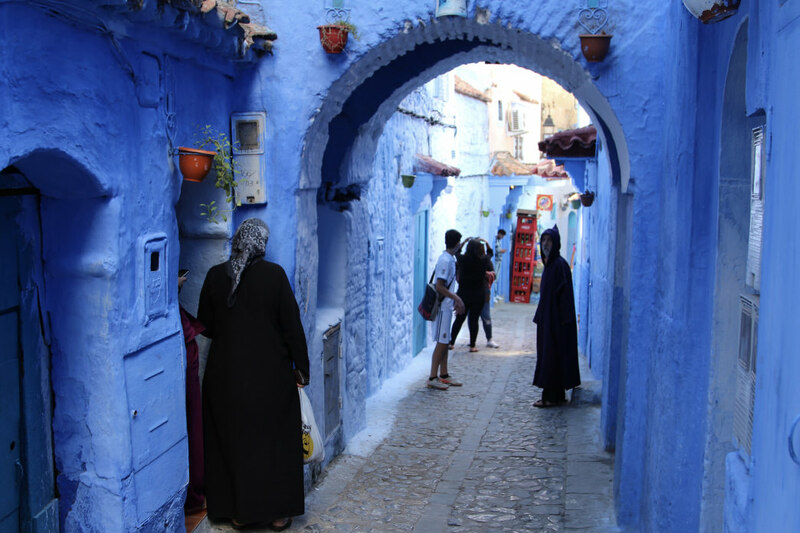 Chefchaouen is already listed above as a must-see city, but the nearby outdoor opportunities give the town a well-deserved second listing as an outdoor destination. The Rif Mountains rise up high behind the town to an elevation of 6,500 feet, and there are numerous beautiful trails that wind their way up to their peaks and through their valleys, unveiling diverse and incredible views the entire way. The nearby Talassemtane National Park can be reached via taxi or by hiking the mountain road directly behind the city. The most convenient backpacking trip follows this road to the park, which opens up a nearly unlimited list of route options. 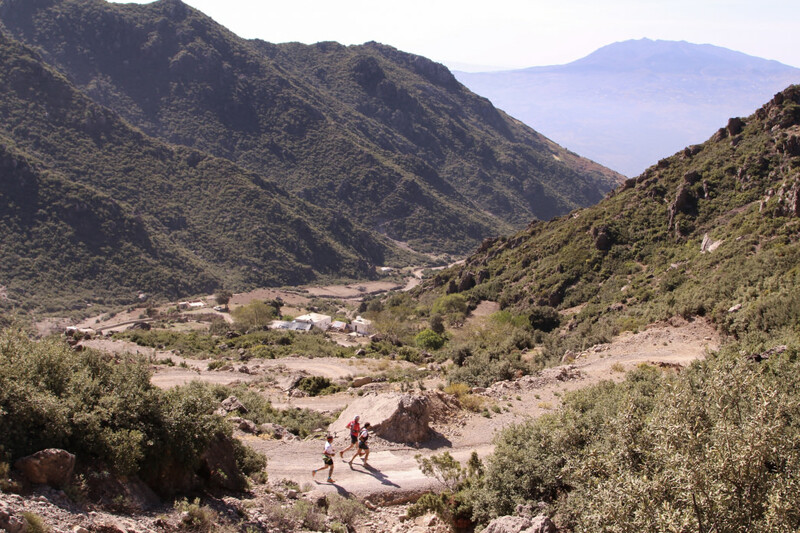 Trail runners will love the Rif Mountains behind Chefchaouen, and this same destination is home to a beautiful leg of the EurAfrica Trail stage race. You should be aware that travel in Morocco, especially travel that includes some outdoor adventure time, isn't always relaxing: "just in case" antibiotics are necessary, bottled water is the only water you need to mess with, transportation takes a long time, and it is HOT. With all this being said, however, if you're looking for a fantastic, affordable adventure destination that includes both stunning backcountry and exotic urban exploration alike, Morocco shouldn’t certainly be near the top of your travel bucket list. 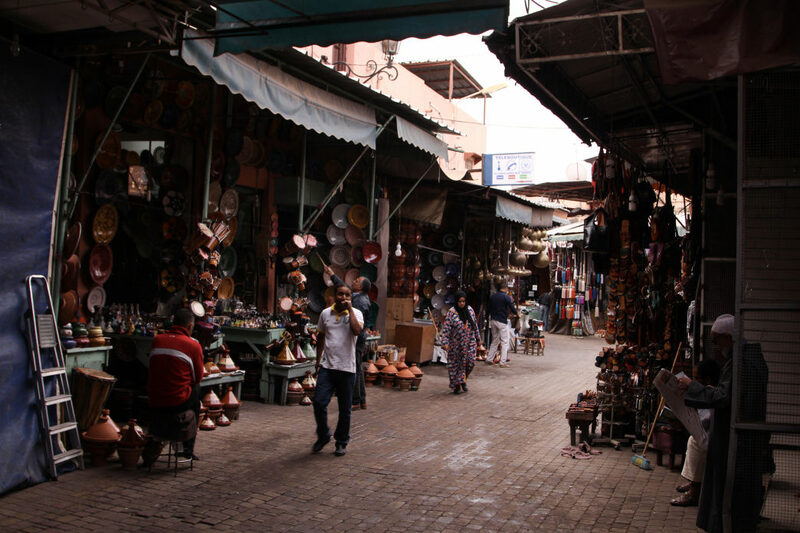 Bartering is expected in the souks, so be sure to negotiate 30-50% off of anything you are trying to buy. Museums, palaces, and most other attractions are very inexpensive and are worth spending a few minutes checking out (for around $1/person). Try to only eat food that is pre-packaged or cooked upon ordering, plenty of people get traveling sickness in Morocco. Taxis are not metered, so settle on the price before you begin your ride. It is often a good idea to ask someone what the cost should be beforehand. The Moroccan culture is largely against alcohol, especially public consumption. Grocery stores in larger cities will sell everything you could want, but you will not find it often in the medinas or at restaurants. Camp fuel is very hard to come by, but there is a small gear shop in Imlil (which is very expensive). Using an alcohol stove or an MSR International would be the best options. And, as always, watch out for pickpockets.